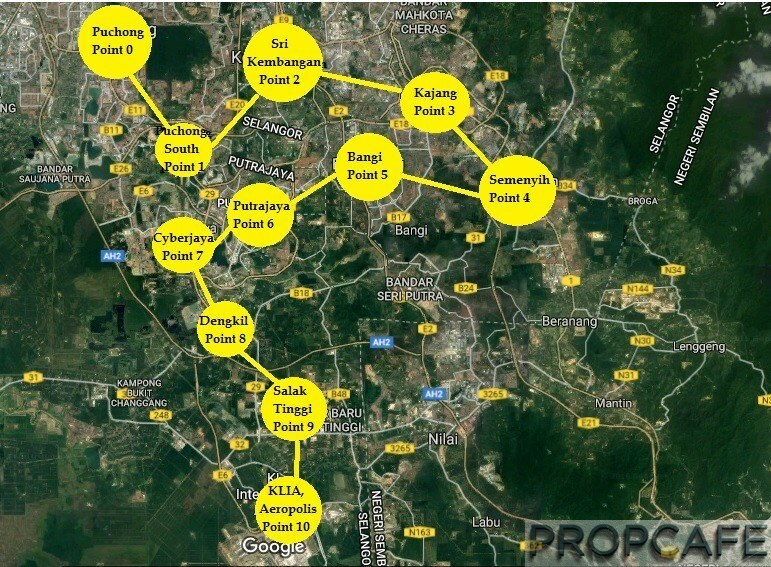 Klang Valley Southern Corridor becomes the focal point of many developers’ in recent years. The “Herding behaviour” and rapid development in certain parts of region always follow government strategic plans especially the spillovers from the massive infrastructure expansion or thematic corridor. The developers always the first to “smell” and act on it. 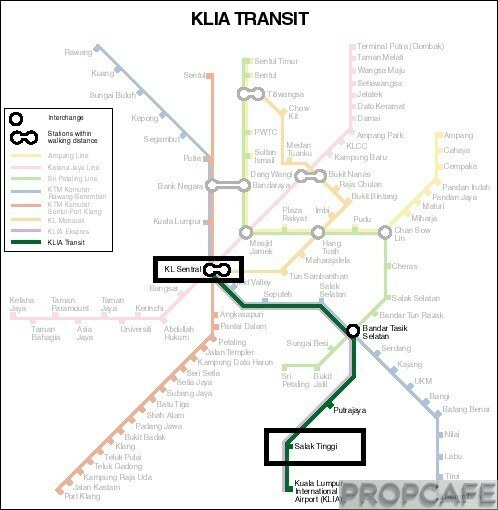 Klang Valley folks do not need to be genius to realise the Klang Valley “South” is the way to focus in the next 5-15 years, simply based on the plan of Mass Rapid Transportation (MRT) lines, High Speed Rail, and Airport City initiatives. It is easy to say about expansion story based on, for example, Southern Point 1, 2, then expand to 3. However, it is crucial to also know where the “End Point” of the southern corridor is as the development can always start or come from both ends. If Point 0 is Puchong, then PROPCAFE sees the end Point 10 at KLIA. 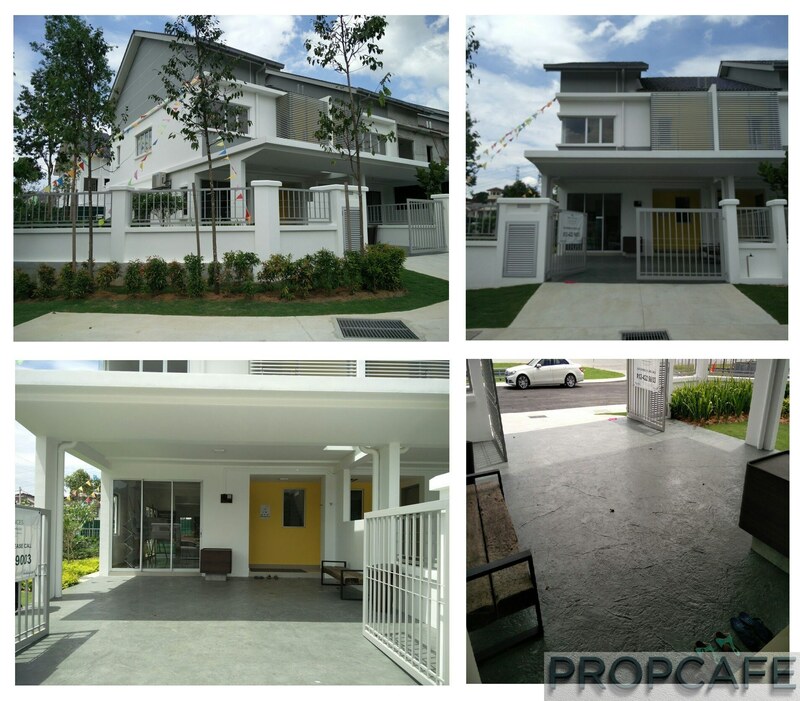 This review will focus on Paramount Property’s latest township – Greenwoods, Salak Perdana (Greenwoods), which is located at “PROPCAFE Klang Valley Southern Corridor – Point 9” in Salak Tinggi (GPS Coordinate: 2.839683, 101.725162). The whole township is under freehold lands with a total size of 237 acres. As part of Bandar Salak Tinggi which is the “Capital” of Sepang district, the neighbourhoods have already come with existing amenities, infrastructure, SME industry (e.g. KFC hatchery, Glove Manufacture, Steel Industry, Technology Incubation Centre & etc) and government agencies (Veterinary Public Health and National Metrology Laboratories, SIRIM & etc). Greenwoods (G) is surrounded by lush green lung and neighbouring with the emerging townships of Dengkil, Nilai, Putrajaya, Cyberjaya, Bangi and future KLIA Aeropolis, which come with plenty of economy activities and job opportunities within 5 to 15km radius. 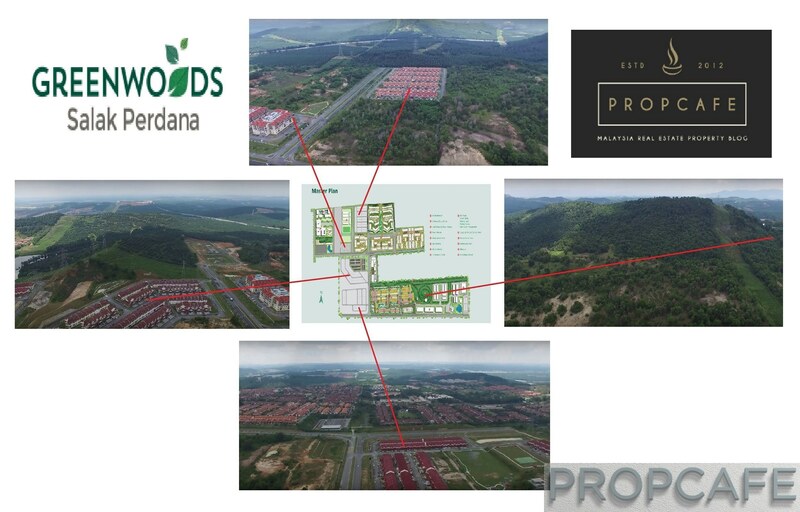 To further zoom into the site, Greenwoods is located near to Kota Warisan, Xiamen University, KLIO, and opposites the matured residential area of Bandar Salak Tinggi – Taman Dahlia/Mawar/Seroja. By car, residents in Salak Tinggi can still reach Kuala Lumpur City Centre via the Maju Express Highway (To MEX – 18mins from Greenwoods). Other highways includes ELITE Highway via new proposed interchange @ B29 (14mins), North-South Highway via B32 (15 mins), KLIA Expressway via B32 (16 mins) and Jalan Kajang-Dengkil via B48 (16 mins). ERL station at Salak Tinggi, as the most convenient transportation to residents in Salak Tinggi, connects Salak Tinggi with Kuala Lumpur City Centre in just merely 25-30 mins (Salak Tinggi – KL Sentral) and passengers to KLIA in just 5mins (Salak Tinggi – KLIA). The link of ERL to LRT, Monorail, MRT and future High Speed Rail (HSR) lines will further ease the residents’ journey to Greater Kuala Lumpur in near future. Within the Salak Tinggi, Greenwoods can easily access to various part of Salak Tinggi and highways above (refer to map below). Due to the close proximity with other nearby townships, amenities are aplenty within and surrounding Greenwoods. The distance of 10km in KL City Centre could be seen as a long journey due to its heavy traffic, it may be more useful to know the time spend on the road to reach the destination in this part of Sepang as the traffic is relatively less hectic here. The below table will help you to know more about the amenities with your own assessment on the distance/time spend for each destination. Greenwoods, defined in Oxford Dictionary as “a wood or forest in leaf”, is conceptualised to inspire community living with ample community spaces planned in harmony with the natural, undulating landscape of the area. 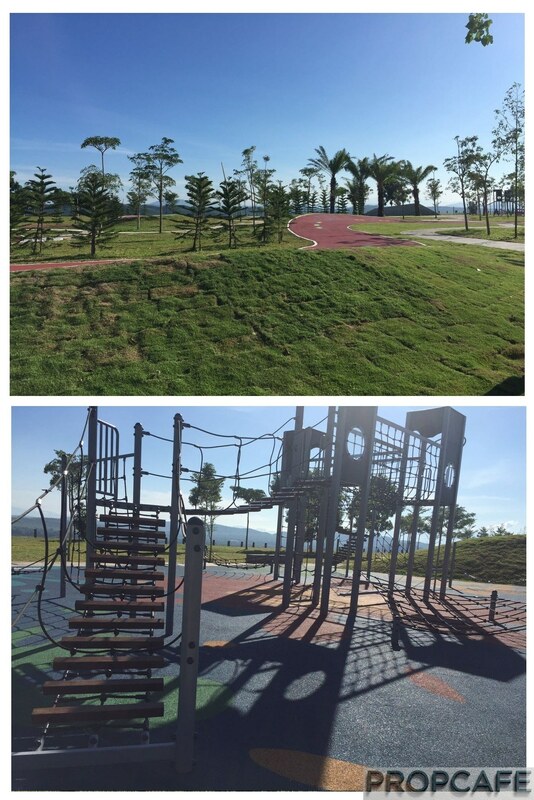 The hiking trail, jogging track, cycling park and interactive playground promote an active lifestyle while pocket farms further draw residents out of doors to engage in some community projects. Open parks and a recreational pond provide more outdoor options or some fun and sun. Greenwoods – “My Home, My Community”. 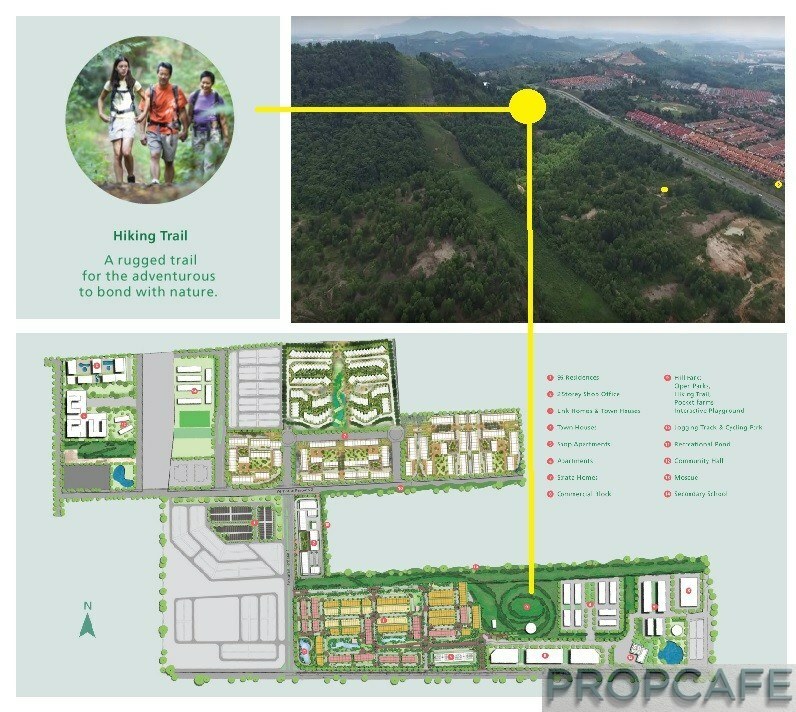 The developer has smartly ride on the nature of the lands and come out with a nice masterplan that fulfill the needs of the community in Salak Tinggi. 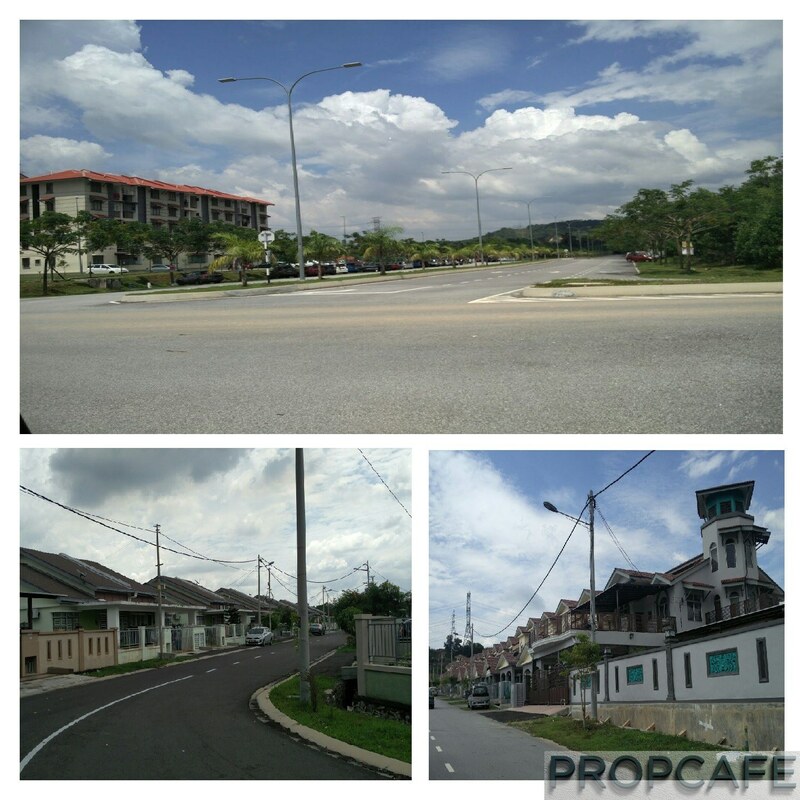 If one tries to drive around Bandar Baru Salak Tinggi and nearby townships, it is not hard to observe that there are lacking of safe and family oriented lifestyle residential developments. Greenwoods fills up this white space to embed six green elements and provide a healthy green living lifestyle for Greenwoods residents (watch video below). The lush green meadows sprawl across Greenwoods with the iconic community space at Hill Park. 1. Hiking Trail – Adventurous trail at a well preserved eco-system. 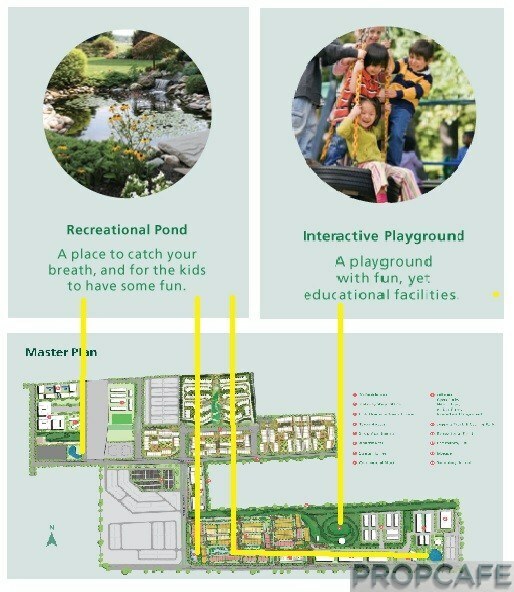 Green landscaped parks – Safe haven where children can play free. Pocket farms are the community projects where growers and community consumers providing mutual support and sharing the risks and benefits of farming and food production. 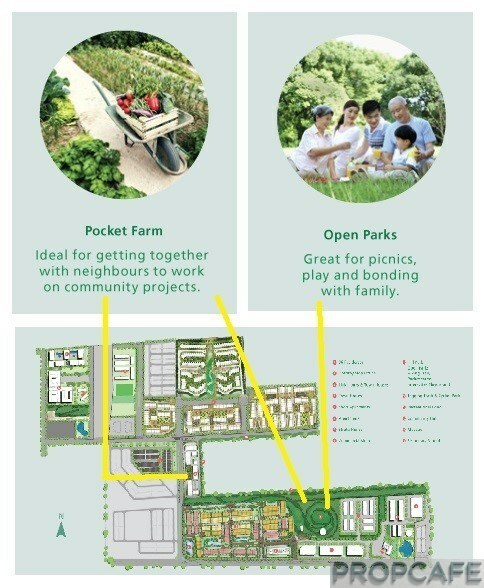 Other than the initial plan on the pocket farms (see locations below), Paramount Property is currently exploring to include more farms in the masterplan. The place with family oriented living amidst with natural and green sanctuary. Community spaces and outdoor sporting activities with dedicated cycling path. 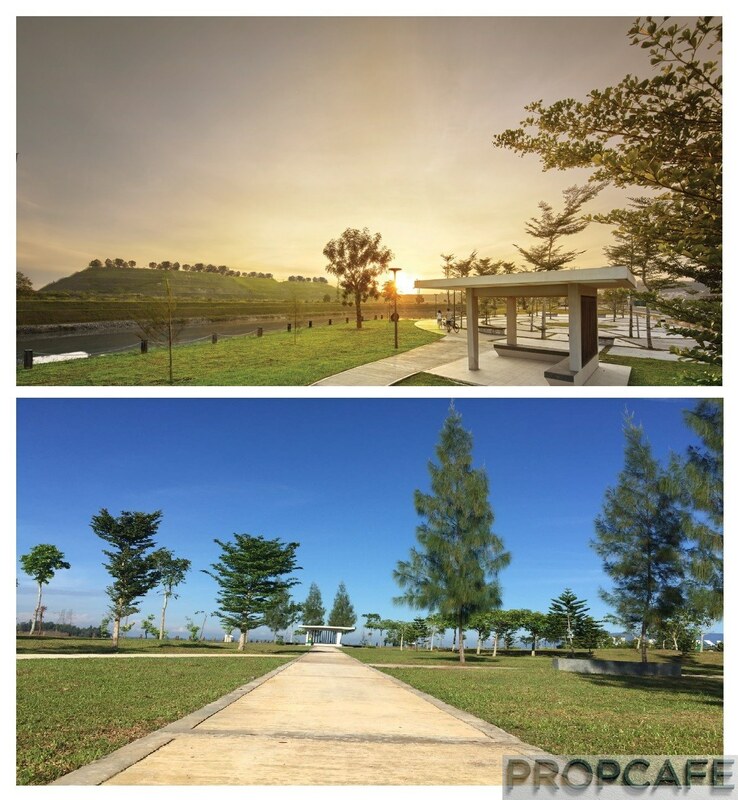 Similar Hill Park concept has been executed in another project called Bukit Banyan in Sungai Petani by Paramount Property. So, Greenwoods residents may expect similar concept (see below) within the Greenwoods township. For the first phase of residential properties (96 Residences) in Greenwoods, developer will help the resident association to apply the permit to be the fenced and guarded (F&G) community and at the same time build the fence and guardhouse in each of the parcel. Of course, all are subject to authority approval. While the trend is going toward strata title gated and guarded (G&G) environment, it is important to understand that the maintenance will be very heavy and it may not work well in certain communities due to its restrictions and strata title act compliance. Even F&G is relatively new to Salak Tinggi, therefore, it is definitely a wise move to make Greenwoods landed properties the individual title F&G rather than strata G&G. Greenwoods is surrounded by undulating lands with hill/forest! A picture is worth a thousand words! It is good to know that 33.68 acres out of 237 acres lands will be allocated and maintained as green. Under the masterplan, Greenwoods consists of Double Storey Link Houses, Shop Offices, Apartments and Shop Apartments, which spread across 12 parcel of lands. Paramount Property has launched two phases (opposite each other) – 96 Residences (96 units of Double-Storey Link Houses) and Greenwoods Belian (47 units 2-Storey Shop Offices). The response from buyers were overwhelmed which reflected in sales charts below with SPA signed. The rest of the phases are still under planning stage, therefore, the total number of residential landed, apartment or commercial units are not available for time being. Before the previous developer sold the lands to Paramount Property in 2015, few parcel of lands have been developed, mainly landed properties (see below). As there is height restriction set in Salak Tinggi due to its proximity with KLIA airport, currently there is only one low-rise apartment in Salak Perdana. 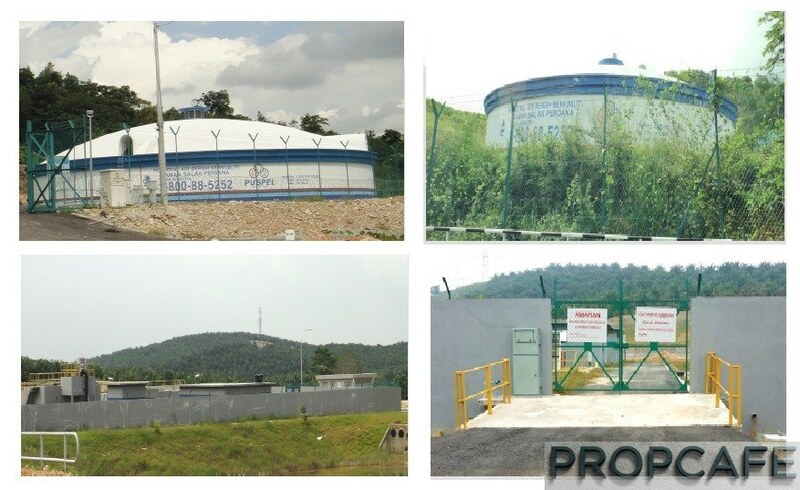 Although it is a new township, Greenwoods has already came with ready infrastructures to serve communities (see below TNB substation, Water tanks, and sewerage treatment plant). More energy will be flowing into Salak Perdana once the six living lifestyle elements blended into this township and surely, the hill park would be the magnet for the residents in Salak Perdana and neighbouring communities as there is nothing similar available within Salak Tinggi. It is breeze journey to Greenwoods with green, hills, and trees, however, once you reached the Greenwoods, the high tension pylons are very noticeable. According to Paramount Property, those parcels that near to high tension cables will be kept at least 50 feets away and with majority of the high tension cables are sitting at the hilly sides which may reduce the visibility from the flat lands. Paramount Property has more than 35 years of proven track record to deliver quality homes in Klang Valley and Sungai Petani. 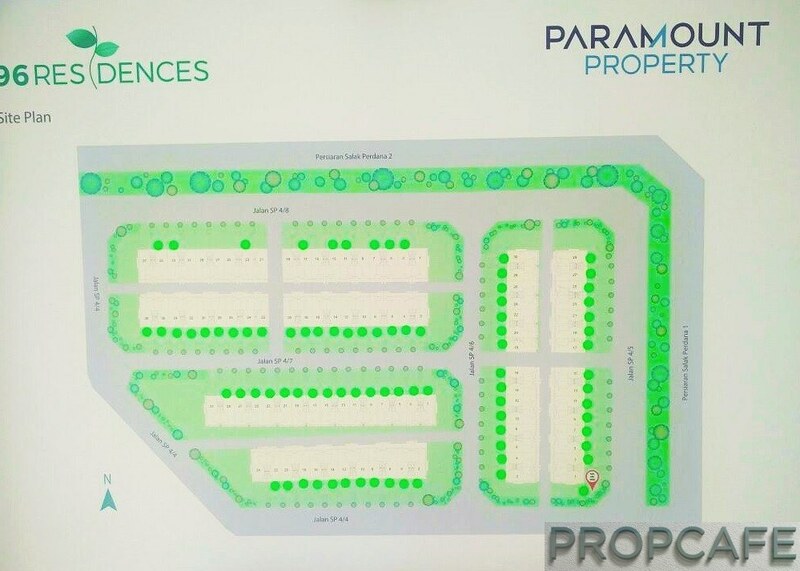 To build on the success of its Kemuning Utama project, Paramount Property recently delivered the vacant possession to purchasers of the modern contemporary Sejati Residences in Cyberjaya and integrated development of Utropolis in Glenmarie, which see massive improvement in term of its landscape and architectural design. Paramount Property is an award-winning developer and the latest award received by Paramount Property includes The Edge – PEPS Value Creation Excellence Award 2016 for its Kemuning Aman project in Kemuning Utama. With the commitment to build quality homes, Greenwoods will be assessed and certified by Quality Assessment System in Construction (QLASSIC) which is an assessment system to evaluate the construction workmanship quality based on Construction Industry Standard (CIS). Paramount Property is not in hurry to launch other phases in Greenwoods based on PROPCAFE’s observation. The next residential landed property launch in Greenwoods would be in end of 2017 and the pricing is expected to be still very affordable. In addition, based on the take up rate of 96 Residences, Greenwoods clearly shows its competitiveness with other developments nearby that comes with F&G concept. In short, Greenwoods should attract buyers who look for a relatively more affordable property that come with greenery lifestyle elements. 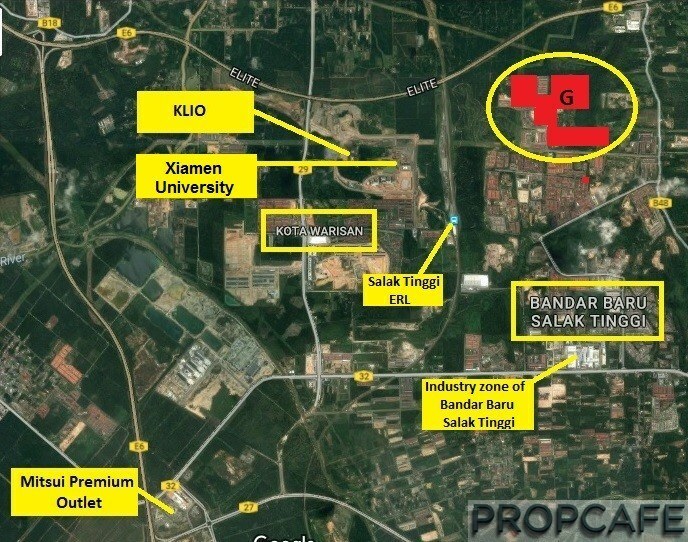 The scarcity of land has pushed the massive development toward Klang Valley “SOUTH” which the lands are still relatively cheap and affordable. However, any “movement” needs the “buy-in” and joint efforts by big developers in order to make it happens in a relatively shorter horizon. This “Synergy” is important to bring more variety of properties, concepts and awareness to a relatively underdeveloped area like Salak Tinggi. 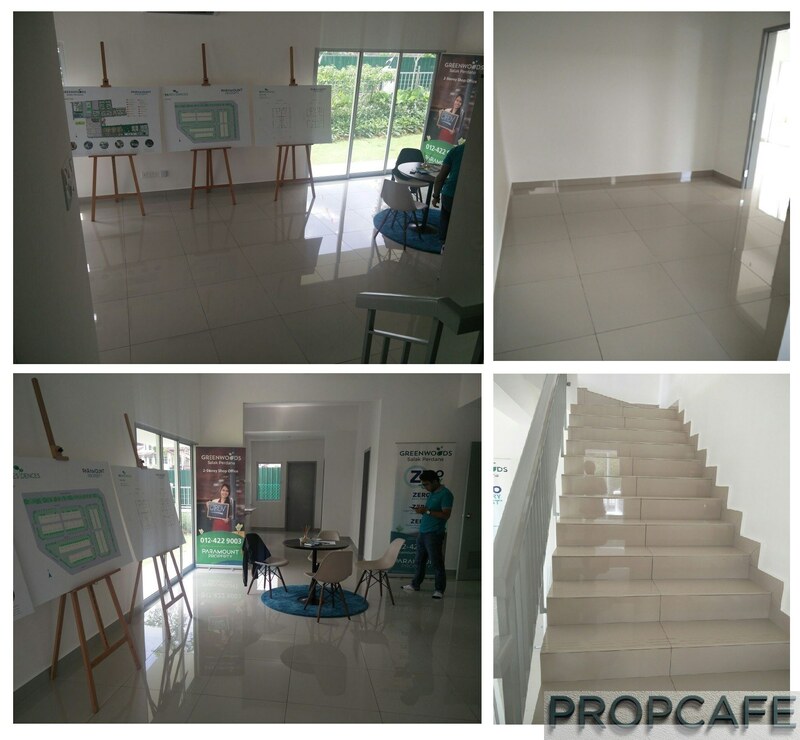 If you look at PROPCAFE Klang Valley Southern Corridor – Salak Tinggi (Point 9), unsurprisingly, IOI Properties (Warisan Puteri), KIP Group (KIP Central), Sime Darby (Serenia City), Sunsuria (Sunsuria City), Glomac (KLIA Saujana) and Hectare Heights (Suria Warisan) are having large land bank and presence here (see the map below with colours). The future developments are all surrounding Xiamen University and KLIO and located close proximity with each other. A quick check on the developments above shows it covers all aspect of future city’s need, facilities and amenities in both commercial (hotel, retails, office, mall, hypermarket, leisure) and residential requirements (landed properties, highrise, apartment, SOHO & etc). These massive developments are expected to transform Salak Tinggi into a self-sustainable vibrant city in years to come. 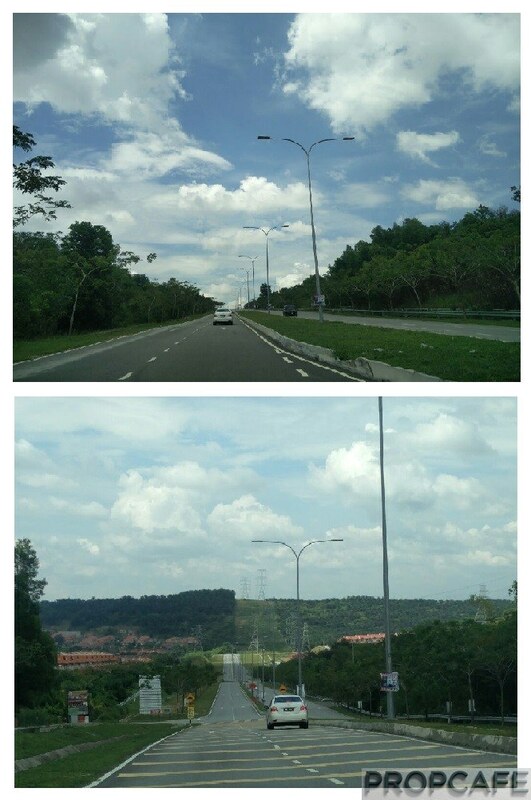 Mukim Sepang and Dengkil has approximate 200,000 population where 35% are 20-35 years old. The future transformation may attract this large young group of potential upgraders or new “blood” within or from surrounding districts. Population growth is always a function of economy activities, job opportunities, amenities, and lifestyle components. 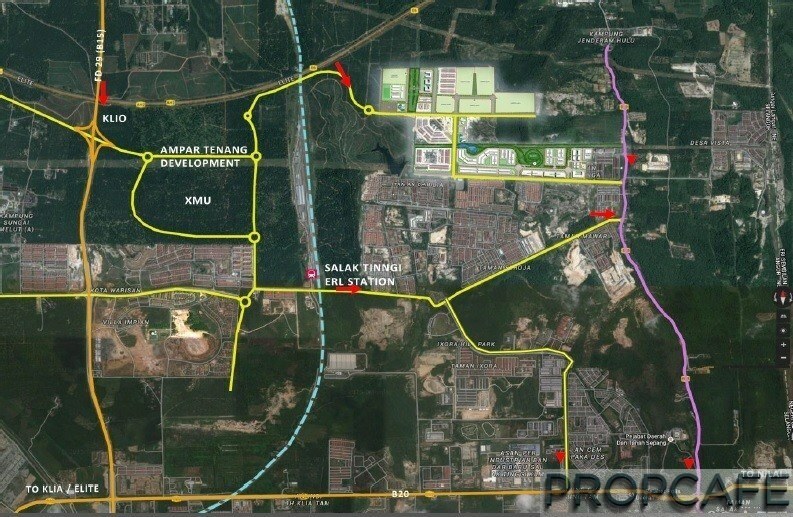 With this in mind, you may note that other than the developments above, the spillover of future development of KLIA Aeropolis that sits at 404.7 hectar land will be another potential booster for the growth in Salak Tinggi over next 10 years. The completion of this airport city will see the delivery of Air Cargo & Logistics zone, Business and Aviation Park, Convention Centre, MICE and leisure (see Video 1 below). It also comes with components like Auto City, Water Theme Park, Golf course, and University in future phases (see Video 2). It is always very interesting to hear different views from investors and own-stayers when come to property hunting. The definition of “FAR” is always depend on the distance of two points (start and end). 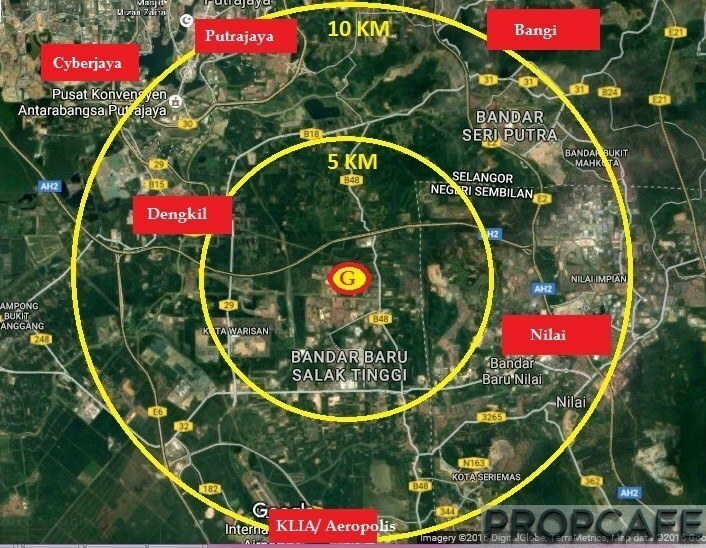 However, the persons (own-stayers) who are having daily routine in Kuala Lumpur City Centre, Shah Alam, Petaling, and Cyberjaya/Dengkil/Bandar Salak Tinggi/Nilai/KLIA may give you different answer when you talk about location such as Salak Tinggi. 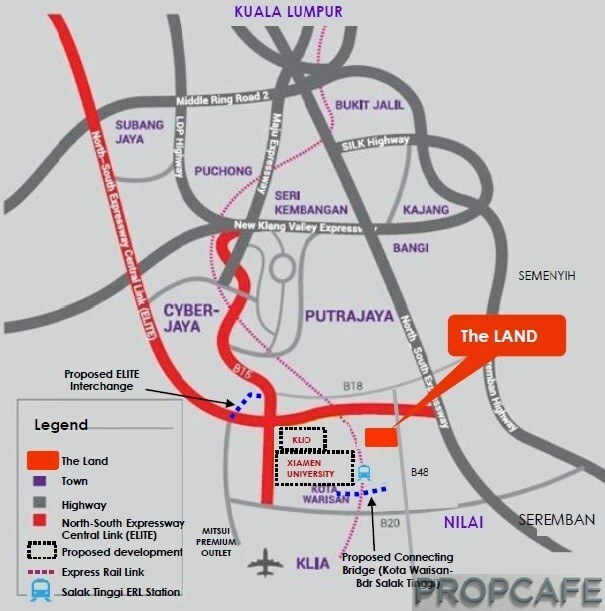 While many investors may prefer to focus on PROPCAFE Klang Valley Southern Corridor Point 1-5, others who believe in the growth of KLIA Aeropolis may choose to park their money backward from Point 10 as the properties are relatively cheaper with potential higher return on investment (ROI). In short, Greenwoods will be rejuvenated with more lifestyles and become a vibrant township in next 5 to 10 years. Good luck and Happy Property Hunting! 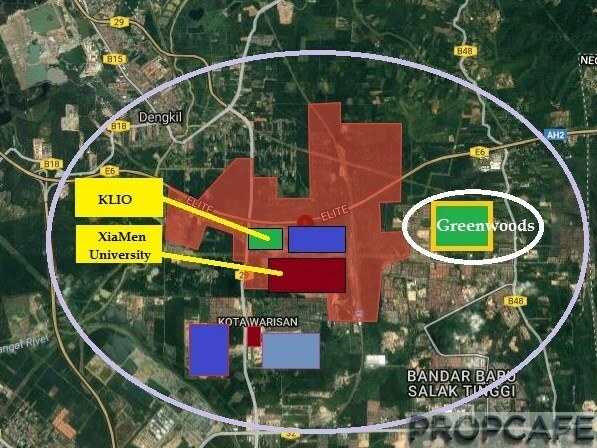 Greenwoods’ first phase link houses, which priced about RM500k, were almost sold out. Practical layout with spacious living area, a reasonably big kitchen and guest room. Quality 2 x 2 tiles and washroom sanitary ware. Unfortunately, no property is perfect. 96 Residences comes with only 1 phase power supply, chain-linked back fence and no air-conditioner pipe given. More like reading a short story novel than a property article…. Even Paramont SA couldnt do it better. I simply like the idea of point 1 to 9 of redefining South KV. Only propcafe can do that. So far best south KV write I ever read.